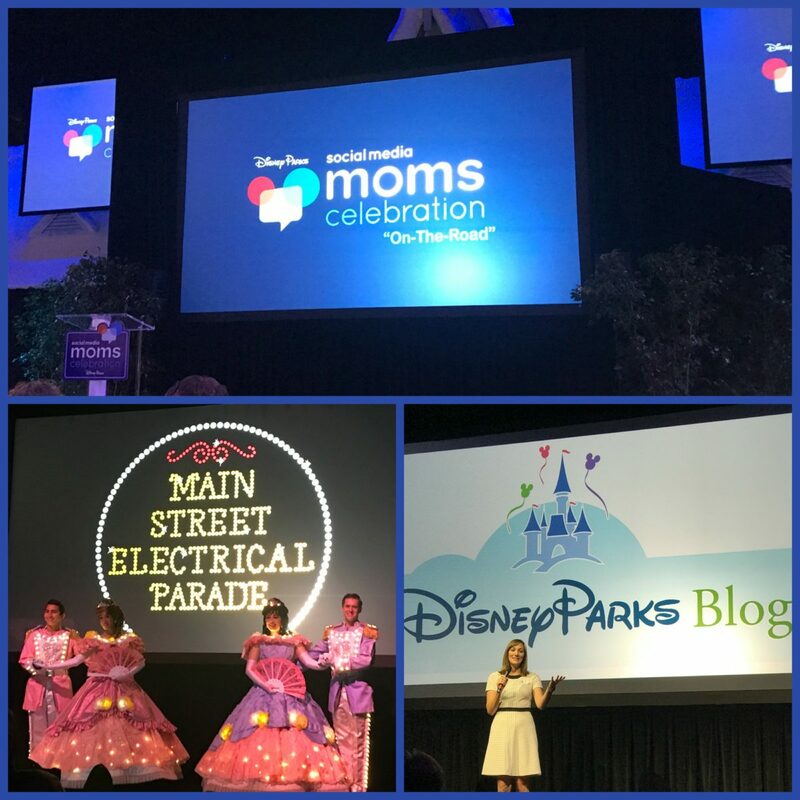 Last week I had the pleasure of attending the Disney Social Media Moms Celebration. What a treat! So many exciting things are happening at the Disney Parks! It is rightly called a “CELEBRATION.” That is exactly what it is – a celebration of all things Disney. I learned so much and I’m thrilled to have the opportunity to share with you some of the new and exciting things happening now at the Disney Parks and what is coming. We spent the day at Disneyland and Disney California Adventure Park when we were there for the Disney Social Media Moms Celebration. For you Disney lovers out there, you know it truly is the Happiest Place on Earth. What a fun day! Right now at Disney California Adventure Park it is the “Summer of Heroes.” As we were walking around the park we saw Spiderman, Black Widow, Hawkeye, Captain America, and other Avengers heroes. Great photo opportunities! 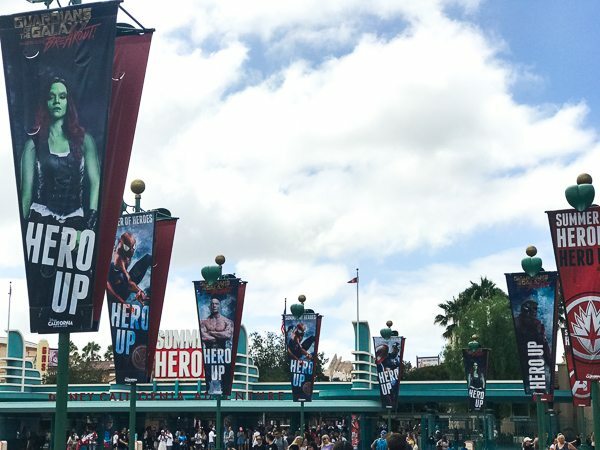 I personally love the “Hero Up” banners around the park. We are all heroes, aren’t we? I love the reminder and challenge to find the hero within each of us. Experience Summer of Heroes until September 10th. 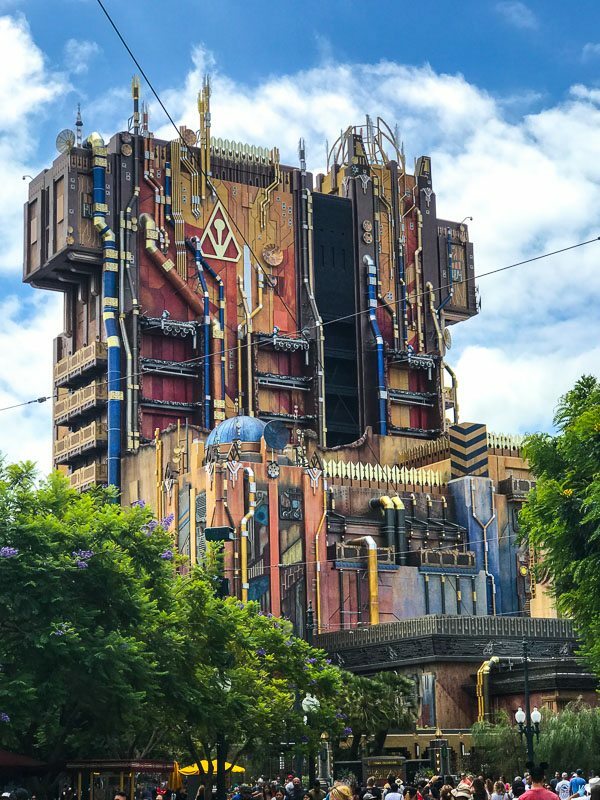 Speaking of heroes, we got up close and personal with the heroes of Guardians of the Galaxy on the hottest attraction at California Adventure right now, Guardians of the Galaxy – Mission: Breakout! The ride is a blast! I have to admit I was sad to see Tower of Terror go, and I didn’t know if I would love the new ride. Boy, was I wrong. The ride is amazing! You can tell from the photo how much fun it is. It brings you right into an action packed adventure with all of the heroes from Guardians of the Galaxy. 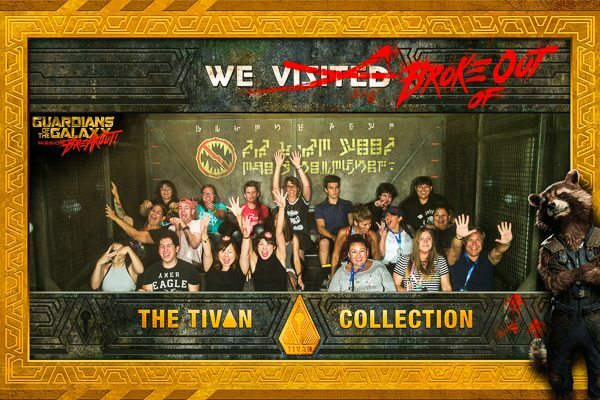 There are six different endings to the “Mission: Breakout!” on the ride. We experienced two of them, and they were both incredible. The music was different on both rides too, both were classic rock songs from Peter Quill’s mixed tape. 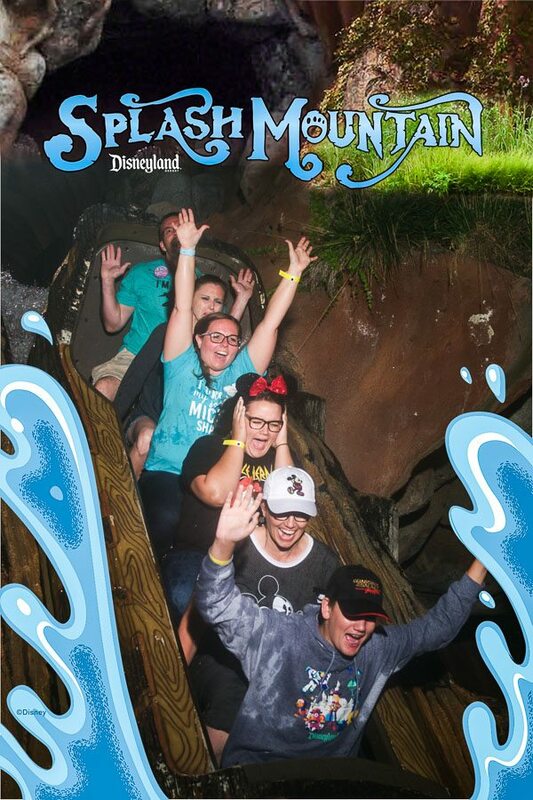 We were literally singing along as we got off the ride. I can’t wait to go back to experience the rest! 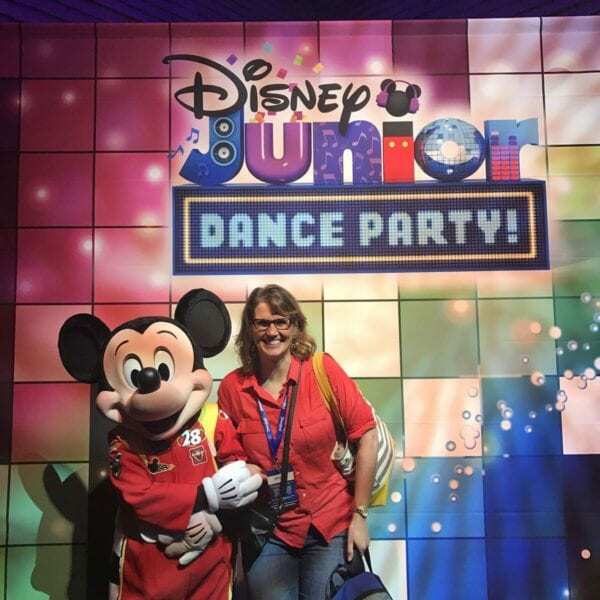 Also, at Disney California Adventure Park this summer is the Disney Junior Dance Party! 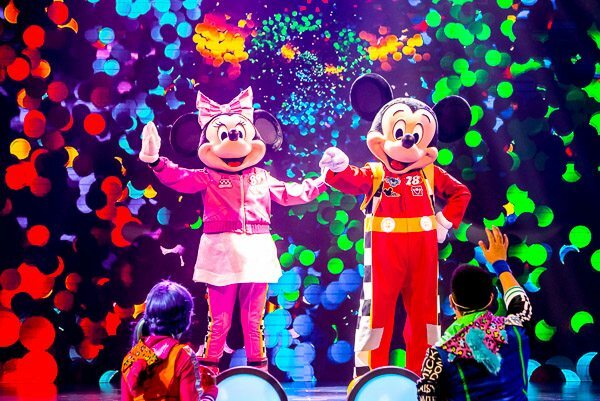 You can dance and sing along to all of your favorite songs from the Disney Junior shows. I got to personally meet Mickey from Mickey and the Roadster Racers. I have to say he’s a pretty great guy, and handsome too! The Disneyland Railroad is back! It was closed for over a year for renovations and has re-opened with beautiful new scenery and 5 waterfalls! In 2019 the railroad will have an incredible view into the new Star Wars land. Fantasmic! returned to Disneyland on July 17th. This show is spectacular! Fireworks, video projected on water, lasers, pirate ships (with Captain Jack Sparrow! ), Disney princesses, and of course, Mickey! It is absolutely magical! Right now Max Pass has an introductory rate of just $10 a day which includes a Photo Pass! That means that you can link up and keep any photos taken by cast members around the park including ride photos. We definitely took advantage of grabbing the pics of the rides we went on. Always a favorite at Disneyland for us is the FOOD! 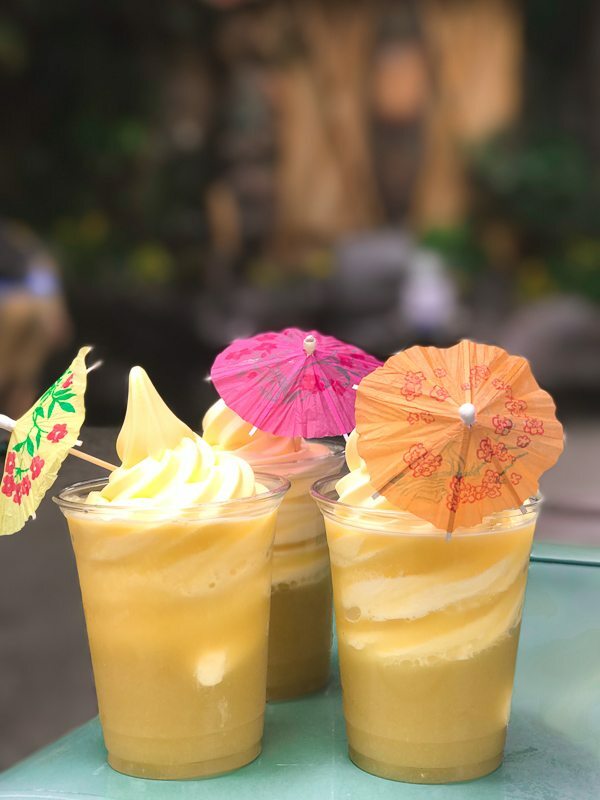 We highly recommend the Dole Pineapple Whips, (we personally love the Dole Whip Floats) especially on a sunny California day at the parks. They really hit the spot! Check out more of our favorite foods at Disneyland here. 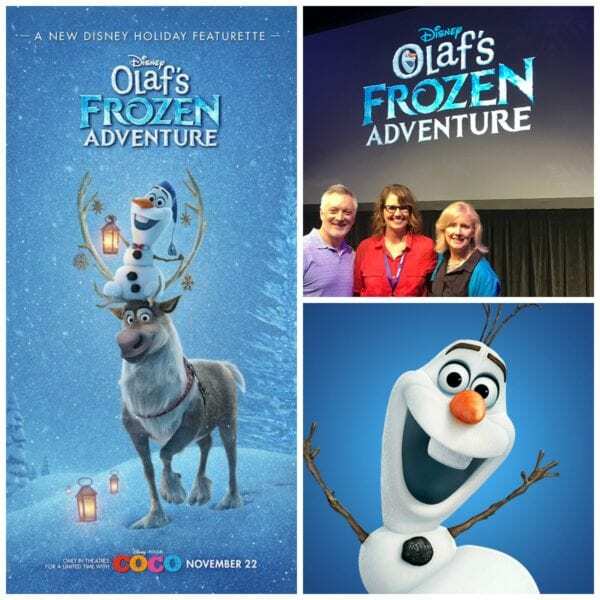 As part of the Disney Social Media Moms Celebration, we had the unique privilege of a getting a sneak peek of the upcoming short film “Olaf’s Frozen Adventure.” Not only did we get to see select scenes from the film, we met the directors, Stevie Wermers and Kevin Deters. It was such a treat to hear about their inspiration for the film, and to see their vision for it come to life on the big screen. All of the characters we love from Disney’s “Frozen” are in the film with the original cast. I loved the songs in the scenes we were shown. They are creative and catchy and charming. “Olaf’s Frozen Adventure” will premier in front of the Disney/Pixar film, Coco, on November 22, 2017. It is 21 minutes long. Here’s a fun fact – Olaf’s Frozen Adventure is the first Disney featurette to be theatrically released since 1990 when the Micky Mouse short, The Prince and the Pauper, was released with The Rescuers Down Under. The official name for the new Star Wars inspired lands at Disneyland and Walt Disney World was announced. The name is Star Wars: Galaxy’s Edge. Mickey and Minnie’s Runaway Railway will be a new attraction at Disney’s Hollywood Studios. Two new attractions were announced for Epcot at Walt Disney World – Guardians of the Galaxy and Ratatouille. The attraction, Tron, that has been so popular at Shanghai Disneyland, is coming to Walt Disney World. 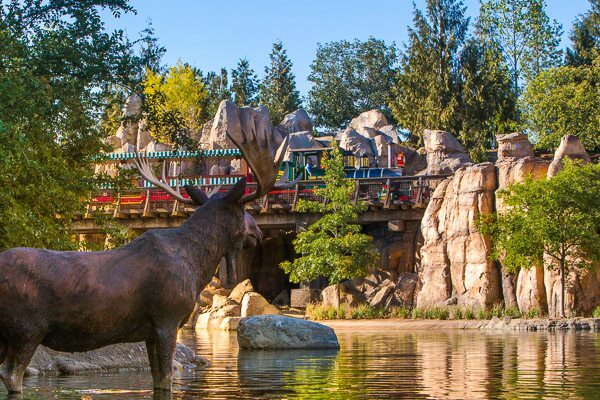 It is scheduled to open in 2021, the 50th anniversary of Walt Disney World. Toy Story Land will officially open at Disney’s Hollywood Studios next summer! The new Pixar Pier will be coming to Disney California Adventure park in 2018. The Disney Cruise Line is expanding their fleet! By 2023, Disney Cruise Line will double the size of their current fleet. 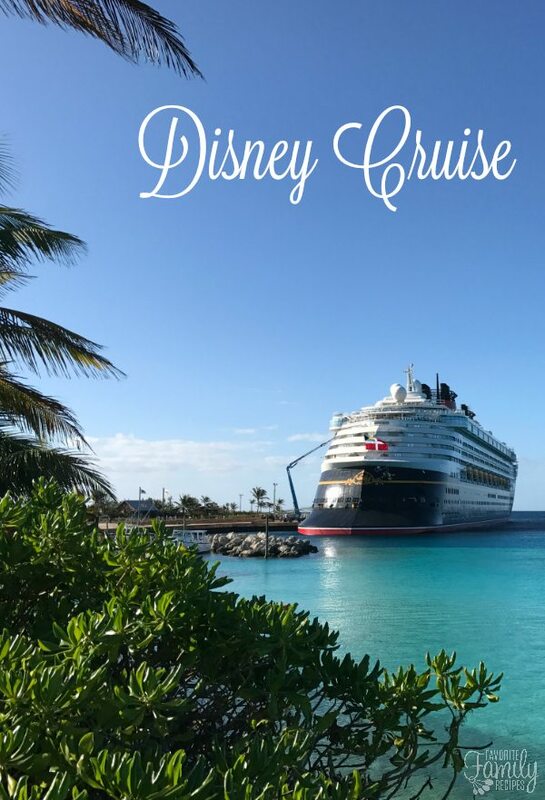 We LOVE Disney Cruise! Read all about our cruise HERE. For more details and up-to-date news from the Disney Parks, check out the Disney Parks Blog. The Disney Social Media Moms Celebration is a conference by invitation for Social Media Influencers. I received some complimentary items from Disney Parks and Disney Media. We were not required to write about our experiences and all opinions are my own.